BeardBros, Thanks for the reply. Most of the reviews I've been able to find date only to the beginning of 2018, so I was interested to see if maybe they had stepped up their game. Looks like they might have. Sounds like you're getting some brutally cold temps up there. We're cold here near Cincinnati, but not like you. Stay warm. Looks good. I had a Revolver X2 on my 2015 and liked it a lot. Felt like it was one of the most secure covers out there. It's held up well since 2015, but then I don't open and close it a lot. Question: How was the quality overall and does it leak? The reason I ask is because I would like to put the X4 on my 2019 LTZ, but I've been reading some negative reviews around the quality of covers coming from Bak Industries. Issues with the rails being cut wrong, rough unfinished edges, seals coming loose, or off when the cover arrived, etc. Thanks for the excellent installation write up. If I get this cover, I'll be sure to refer to it. I stopped using it because when someone sends a text with a picture attached, it would read the entire string of digits. The text never did show up on either of my screens. A low profile tire will never ride as smooth as one with a taller sidewall. That taller sidewall acts as a spring to help soak up bumps. Conversely, a taller sidewall tire will not have the crisp handling dynamics of a low profile tire, again because of the springiness of the sidewall. Unfortunately, you can't have both. If you are looking for a smoother ride, I would switch the tires first. When you get more money, switching to better shocks will help even more, but I believe your best bang for the buck right now is the tires. Thanks for posting this. It's helpful. You hit it right on the head there. I find it amazing and frustrating that GM seems to have given up on this and just moved on. The transmission is the ONLY thing I don't like about my truck. It's also frustrating that there are so many "fixes" out there, all of which never work for everyone. Turn off grade braking, new torque converter, drive in tow/haul mode, etc. Other than a new torque converter, I've tried them all. They seem to work for a while, then the transmission seems to learn it's way back to bad shifting. I have to constantly change up my routine. Oddly, the only thing that helps consistently (but does not solve the issues) is when I mat the peddle up to 70 or so a couple of times. After that, the shifts aren't as rushed and seem a little smoother. Not a very practical solution, but a fun one none the less. My wife has had a '14 and now a '15 Grand Cherokee with the 8 speed and it shifts perfectly. Come on GM. Get your act together! I like them both. Actually prefer the front end on the GMC. Bought a Silverado LTZ Crew cab with the 6.2 liter engine. Why? Price and more importantly, my local Chevrolet dealer is outstanding both in sales and service. The GMC dealers, not quite as much. I love my truck, and I think it's options are awesome. I really love my '15 Silverado LTZ with the 6.2 engine. Best, most comfortable vehicle I've ever owned for taking long trips. Amazingly quiet and smooth riding, with plenty of power in hand for passing. On a recent trip to Virginia Beach, I got 22.6 mpg running 70 through the mountains of West Virginia. On the return trip I got a little less and finished out at an even 22 mpg. I think that's outstanding, especially for such a big, powerful engine. The ONLY thing I don't like about my truck is the transmission. That makes sense. Virginia Beach is basically at sea level and the Cincinnati area is probably plus 600 feet, give or take. I still have the stock exhaust, so I just get a growling sound in V4. I can see where it could be a problem for you with the Borla. My lifetime average is sitting at 18.2. Going into this trip, it was at 18 even. The driving is spread pretty evenly between highway and city. I never expected to get this kind of mileage out of a 6.2, but I'll take it. By the way, I don't drive like a granny, but I'm not a lead foot either. I save that for the Corvette. Yea, the 6.2 is a great engine. I love mine. One of the main reasons why I bought a Silverado over an F150. That and the styling is a heck of a lot nicer, in my opinion. Just curious. Why do you lock out the AFM below 50 mph? My wife and I took a short vacation to Virginia Beach last week and I talked her into taking the truck. I was really interested to see how it would do on a long trip. I was pretty sure it would be comfortable and I was curious about how much mileage I would get. 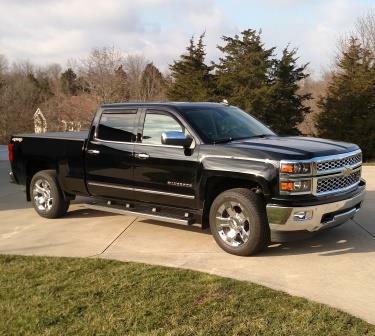 I have a 2015 Silverado LTZ Crew 4x4 with the 6.2 liter engine. The thing weighs 5800 pounds and is shaped like a brick, but I was hoping the cylinder de-activation would help with the mileage. I figured I would get around 20 mpg or so since I regularly get around 17 to 18 in mixed driving. I live near Cincinnati, so the trip would take us across I-64 through the mountains. Wow! Was I ever surprised. I averaged 22.6 mpg for the trip down and finished the trip at 22 even. I think the reduction on the return trip was mostly due to having to buy 93 octane with 10% ethanol in Virginia. I routinely turn off grade braking since it makes my transmission shift better, and I think that helped also. The truck spent a lot of time in V4 mode even on flat ground. I ran between 70 and 75 most of the way. The second surprise was how comfortable the truck was. With that long wheelbase, the ride was smooth and well controlled. Very little wind noise, and the seats were perfect. I normally begin to squirm after about 2 hours in other vehicles, but I was able to go around 4 hours still feeling comfortable. I think I could have gone a lot more, but I was bladder limited. My last truck was a 2008 Tundra Double Cab Limited with the 5.7. I was a nice truck, but there is no comparison with the Silverado. I was so happy with my truck that when we got home, I washed it while she was unpacking. She thinks I'm nuts, but she did have to agree it was a very comfortable trip. I think I'll be keeping this one for a while. Looks like I'll be making two visits to my dealership, since i have a Corvette too. Oh well, my dealership's great and I can pass the time drooling over all the neat stuff they have on their lot.